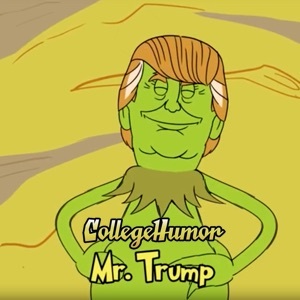 CollegeHumor loves pushing the boundaries, and in this highly unusual political season with a reality show star as a political candidate, it’s no surprise that CollegeHumor aims its sights squarely in the center of the hot topic of the day: Donald Trump. This holiday video, which I was privileged to produce the music for, is a parody of the classic 1966 Dr. Seuss-written You’re a Mean One, Mr Grinch. CollegeHumor has recast the lyrics in parody form to make sharp political commentary against the current frontrunner for the Republican nomination for President of the United States, The Donald. The video is slightly NSFW.